The action sometimes conjures a thrill-ride's breathtaking quality or, in other words, Terminator Salvation's only hope of redemption with audiences. 130 min. Warner Brothers. Director: McG. Cast: Christian Bale, Sam Worthington, Bryce Dallas Howard, Anton Yelchin, Moon Bloodgood, Common, Helena Bonham Carter. In an attempt to prolong the life of a franchise seemingly past its sell-by date, Warner Brothers has literally and figuratively brought out the big guns for Terminator Salvation, the fourth Terminator film. Beside the heavy artillery, we get Christian Bale (from the studio's top-performing Batman franchise) as John Connor and, yes, a CGI cameo from the Governator—just in case. The order of the day is lots of noisy, yawning, metal-crunching mayhem, and purely on that level, Terminator Salvation is passable action trash. But the unfocused story is only half-considered, with important connective tissue no doubt on the cutting room floor (and soon in the home-video bonus features) and lapses in logic that no amount of blooming fireballs can conceal. Most of the relentlessly grim Terminator Salvation takes place in 2018, in a desaturated post-Judgment Day landscape that's the setting for the machines' ongoing holocaust of the human race. Screenwriters John D. Brancato & Michael Ferris (who also wrote Terminator 3: Rise of the Machines, a punching bag for many fans) wrote the underlying script, the first set primarily after Judgment Day (excepting an episode of Fox's just-cancelled Terminator: The Sarah Connor Chronicles), but the finished screenplay is the result of contortions conditional to Bale taking the role of Connor, and a polish by Jonathan Nolan, a screenwriter trusted by Bale. And so it is that John Connor shares equivalent screen time to new protagonist Marcus Wright (up-and-coming Aussie Sam Worthington). Wright, an ex-con carrying a heavy weight and a cloudy past, has mysterious ties to Skynet, the computer system that became self-aware and nuked Earth as an opening salvo in a war against humans. He's also said to have an exceptionally strong heart. Aww. The film's opening sequence leaves little doubt as to what's going on with the Wright character—and the film's previews have left even less. Suffice it to say that Terminator Salvation is a sort of "man and superman" tale with thinly developed super-text of what it means to be human. "We are not machines," says Connor. "If we behave like them, what is the point in winning?!" (take that, American torture defenders!) A few lines like these are sprinkled about the picture merely to excuse the mindless but spectacular sci-fi action; unfortunately, the clunky dialogue and dopey plot twists do damage by inspiring inappropriate laughter. Even more paltry than the themes are the supporting roles. The deeply respected Jane Alexander turns up for only a handful of lines, and Bryce Dallas Howard gets an entirely thankless role as Connor's pregnant wife Kate. Among the women, only Moon Bloodgood's Blair gets an interesting story beat, as she bonds with her savior Marcus. John Connor's "J.C." has always been the promised savior of the post-apocalyptic human race, though here he's still grudgingly taking orders from elder non-believers (especially, in a nice bit of genre-friendly casting, Michael Ironside of Total Recall). Their resistance efforts turn to testing end deploying an "off-switch" signal against the machines, but in his free time, Connor still sends out messianic radio broadcasts to his small but loyal audience of true believers and listens to tapes from his dearly departed mother Sarah (Linda Hamilton). Thanks to her, John knows he had better defend teenage Kyle Reese (Anton Yelchin) from the machines: as fans know all too well, Reese (played by Michael Biehn in the original Terminator) will grow up to sire John after time-traveling into the 1980s. Teen Reese introduces himself to Marcus as the head of the "L.A. branch" of the resistance, whose only other member is a little mute girl (Jadagrace). Kyle's story thread nicely dovetails with the franchise's motif of young men with destinies to fulfill, an idea ever in tension with the motto "No fate but what we make." Director McG focuses on proving that he's capable of more than the candy-colored projectile vomit of movies like Charlie's Angels. There is a gritty intensity to the action, but its conception is mired in the commercial paradigm of Transformers, rather than James Cameron's story-driven entries (Cameron and Gale Anne Hurd conspicuously take no credit for the universe they co-created). McG evokes a Vietnam-esque ground war (choppers, bogs, and trees on fire) between the truly big action scenes starring snake-like Hydrobots and giant people-collecting Harvesters that shed moto-terminators (unmanned motorcycles). The action sometimes conjures a thrill-ride's breathtaking quality or, in other words, Terminator Salvation's only hope of redemption with audiences. 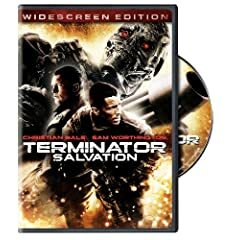 Warner pulls out the stops for its Blu-ray edition of Terminator Salvation, offering two cuts of the film, in hi-def, a plus-sized video commentary, and a couple of cool featurettes. Disc One features the Director's Cut and Disc Two the Theatrical Version. Both spectacularly reproduce the film's theatrical look in minute detail. As in theaters, the image puts forward a desaturated color scheme and light film grain but a sharp clarity and intimate texture. Black level is adequate and contrast is strong, adding up to a potent picture that will please Terminator enthusiasts. The lossless DTS-HD MA 5.1 sound is reference quality. Wake the neighbors with this action-packed track, built for maximum immersive impact. A flurry of surround effects and an internal-organ-stirring low end put the listener into the world of the film. WB's Maximum Movie Mode (last seen on Watchmen) allows director McG to give us a personal tour of the film, including picture-in-picture demonstrations, storyboard comparisons, a Terminator Mythology Timeline, and eleven Focus Points also accessible directly from the menu: "Digital Destruction," "Enlisting the Air Force" ("Molten Metal and the Science of Simulation," "Building the Gas Station," "Creating the VLA Attack," "Exploding Serena's Lab in Miniature," "Hydrobots," "An Icon Returns," "Terminator Factory," "Stan Winston Shop," and "Napalm Blast." This bonus is more than feature-length, due to the branching pods and McG pausing the action as desired to add further commentary. The making-of overview "Reforging the Future" (19:01, HD) covers all aspects of production with set footage and interviews with McG, Halcyon producers Victor Kubicek & Derek Anderson, Christian Bale, executive producer Jeanne Allgood, producer Jeffrey Silver, associate producer Steve Gaub, Sam Worthington, production designer Martin Laing, assistant art director Greg Hooper, location manager Michael J. Burmeister, Moon Bloodgood, Anton Yelchin, set decorator Victor Zolfo, costume designer Michael Wilkinson, Terminator makeup and animatronic effects man John Rosengrant of Stan Winston Studios, visual effects art director Christian Alzmann, ILM animation supervisor Marc Chu, second unit director/visual effects supervisor Charles Gibson, special effects coordinator Michael Meinardus, key powder foreman Anthony Simonaitis, ILM visual effects supervisor Ben Snow, and CG supervisor Pat Conran. "The Moto-Terminator" (8:33, HD) serves up fascinating behind-the-scenes footage of the development, rehearsal with, and performance of the Moto-Terminator in the real world and in dedicated special effects computers. McG, Gaub, Alzmann, Laing, assistant art director Desma Murphy, illustrator Victor Martinez, stunt player Rick Miller, Bale, Chu, and stunt player George Cottle offer their comments on the sweet ride. Fans get more via BD-Live, and a third disc delivers a Digital Copy. All site content © 2000-2019 Peter Canavese. Page generated at 04/18/2019 12:08:51AM.